The information for this article comes from an interview with Velma Elmore Etier of Stockton, CA. The photos are courtesy of her, also. John and Martha Elmore were logging in Missouri, but motivated by the prospect of better timber in Oklahoma, moved there to run a mill. A former employee of theirs sent them a postcard of some very large trees in California and this was motivation for the Elmores to pack up and come to California. They came in 1935, Velma says, expecting to log the trees in the Stockton area, but found fruit trees and mighty oaks instead of the stands of evergreen timber that they had expected. They went up to Chester, then to Westwood, then to Honey Lake, and finally back to Stockton. The Elmores had left Oklahoma with adequate money, but by this time, money was short, so by 1936. the Elmores were living in Linden and picking fruit. Velma met her husband, Delbert, there in Linden at that time. Velma says that her husband Delbert once decided to work in the lumber business also, but one day in the woods with Carl was more than he could endure. John found the timber that he wanted to cut in the Groveland area, and bought a mill that was having a hard time surviving at Buck Meadows. 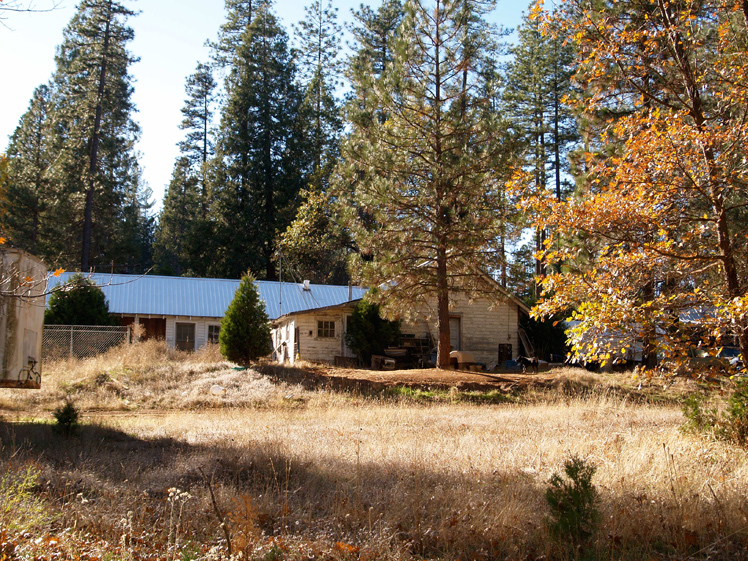 He found the timber that he wanted, but the land owner wouldn’t sell stumpage, so John bought the land upon which the trees grew, and built his mill near Smith Flat just off Old Highway 120. (To most easily find that site today, take the Hell’s Hollow exit off Highway 120. A quarter of a mile off the highway, Hell’s Hollow intersects Elmore Road and you are at the site of the mill and the homes) The lumber cut by that mill was all or mostly bought by a company in Los Angeles, and apparently that company wanted the mill to have an official name so they, the LA company, named it the Big Creek Lumber Company, presumably after the waterway near the mill. John bought and set aside 30 acres for each of his boys, Von, Milbern, Carl, and George. Velma says that most of the logs they cut came out of the Jawbone area. The family home was adjacent to the mill, and homes for the boys were built on the property, in addition to shacks for the other workers and their families. 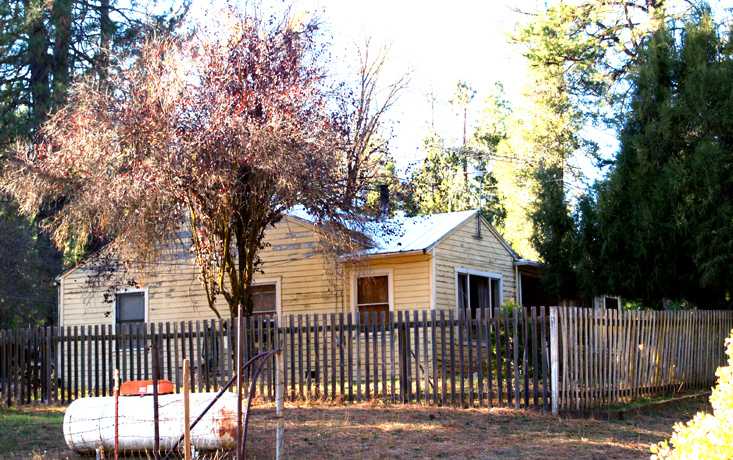 A one room school, The Elmore School, was built next to Von’s house for the children of the workers at the mill. John and Martha had 10 children but three of them died in infancy. There were three living Elmore girls, Zula, Morine, and Velma and they helped out with the things their mother had to take care of such as feeding her men, while the boys worked in the mill. Velma remembers that whenever buyers came by near mealtime, her father would invite them for dinner and they would accept because they knew what kind of a cook Martha was. On the other hand, when those buyers would come up out of the valley, they brought Martha fresh fruits, vegetables, and other goods not readily available in Groveland. 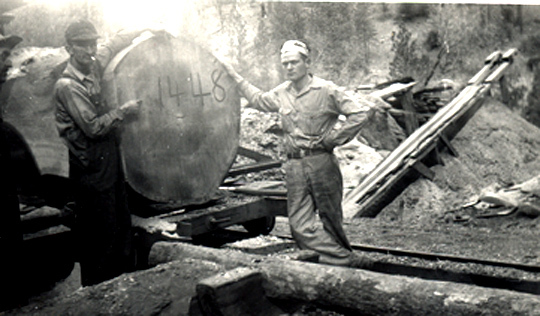 In 1941, Milbern was off-loading the strips cut off the log to square it up and get rid of the bark when one of the strips got caught in the machinery and hit him a terrible blow in the abdomen. He got peritonitis and died. With the mills of that time, a merciful Providence had to be responsible for the survival of life and limb. This mill was rigged with two circular saws one above the other. 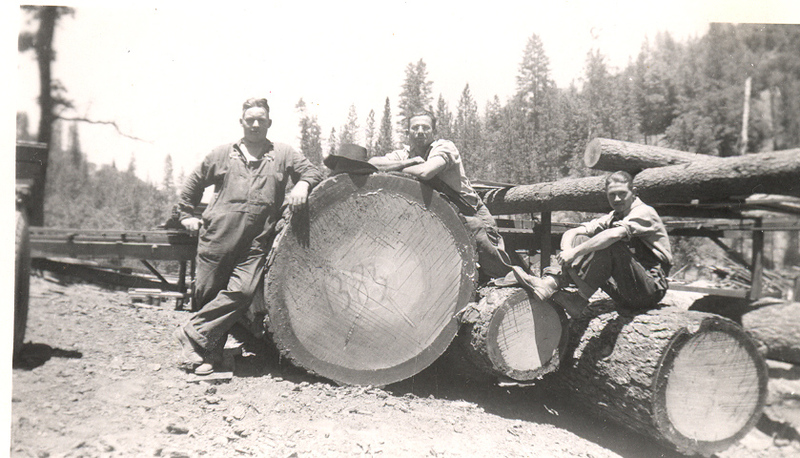 In this way, logs could be cut that were twice the diameter that could have been cut with just one saw. The saw dust would fall down into an area under the saws. One day, John went down into that saw dust area, probably to retrieve something, and without stopping the saws. The bottom saw severed his galluses, (work suspenders) a happening that caused much family consternation. 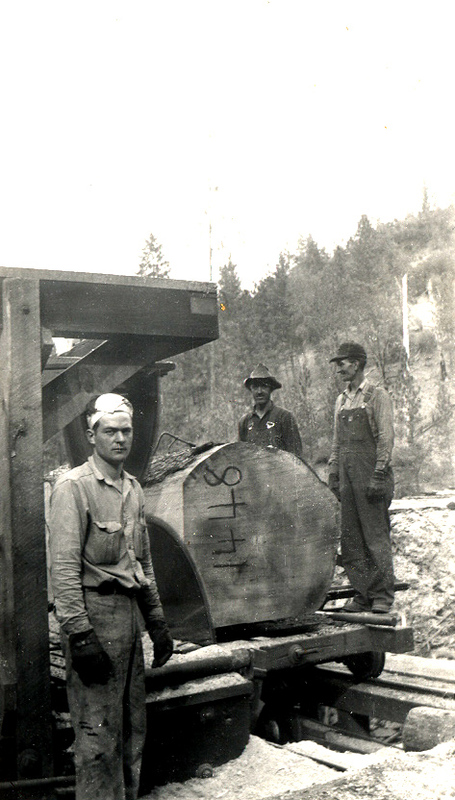 Because lumber was considered a national necessity, all the Elmore men and the employees had deferments from the draft. When the Elmores were ready to retire, they gave the mill to George who operated it for a year or two. He couldn’t find workers that wanted to live up there, so he sold off the machinery in the early 1970’s, and built an RV park on property he owned nearby. . 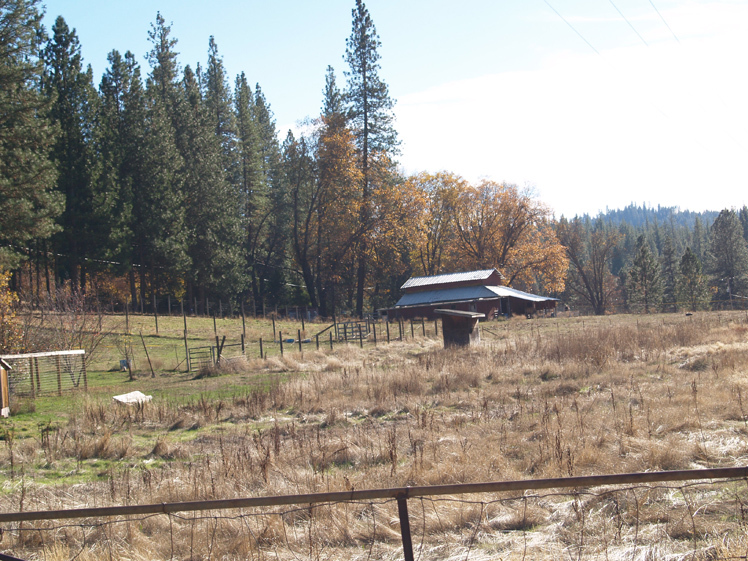 The senior Elmores bought 10 acres in Knights Ferry and built a home on that property. Martha died soon after the move in 1975. Von’s house is still lived in as is the school next door. The old mill site and the two homes are at the intersection of Elmore Road at Hells Hollow Rd. just off Highway 120, in the Smith Station area. The meadow where the mill once stood. To the left out of the picture was the family home, Von’s house is to the right out of the picture up a slight hill, and the school is above that. No vantage point to get the whole picture. Von and Bessie’s house on Elmore Rd. The Elmore School which is now a private residence. 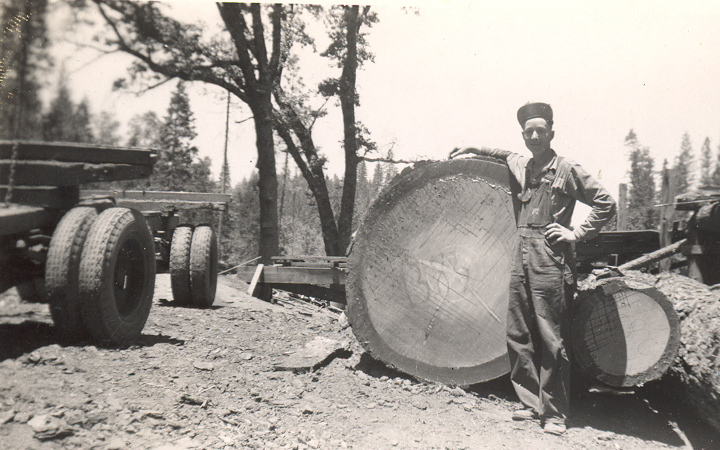 John Elmore up on Chevy logging truck holding a scale stick that he has used to project the number of board feet in the log. He has written that number on the end of the log. George Elmore is the man on the left. His family referred to him as the “Big Man” because he was so different in girth from the rest of the men. George oiling the drive mechanism that apparently moved the carriage past the saws. 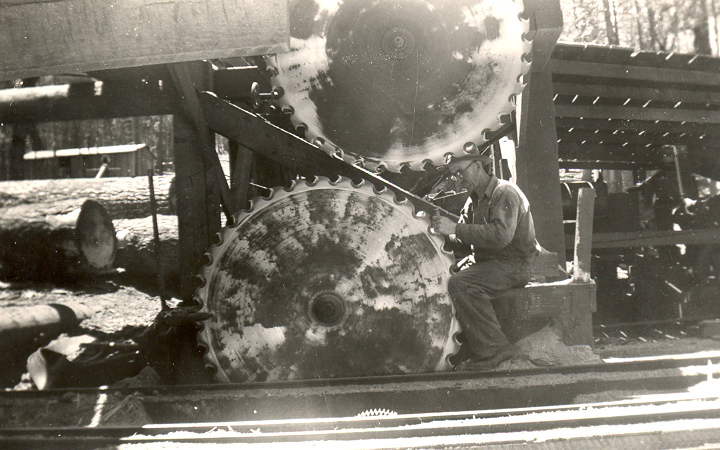 John Elmore working on the saw blades. He is either sharpening or setting the teeth. Carl Elmore on the right with “Dummie” Ruckman, their deaf and dumb employee. There was a shortage of political correctness in those days, especially out in the logging camps. The number painted on the log is the board feet projected to be in the log. Carl (in the scarf), Dummie Ruckman, and John at the carriage. 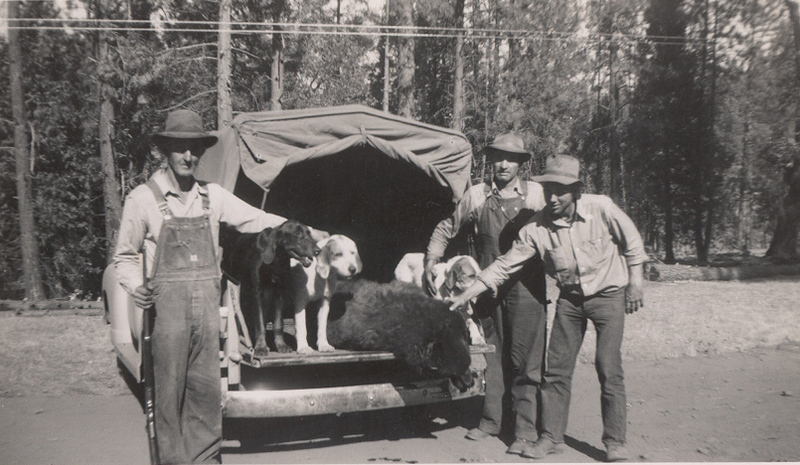 John and two of his boys with their hounds and the bear that they’ve killed. Hunting with dogs was pretty much a standard activity for men from the hill country of Missouri, Arkansas, Oklahoma, and Texas. The foothills of Calaveras and Tuolumne Counties provided them with the opportunity to hunt in very similar terrain, and pretty much the same animals as at home. I really enjoyed reading this article and seeing the photo of the old Elmore School. I was a student there for 1st grade many many many years ago. Since I have not lived in California for 35 years it was great to learn the history and see the photo. 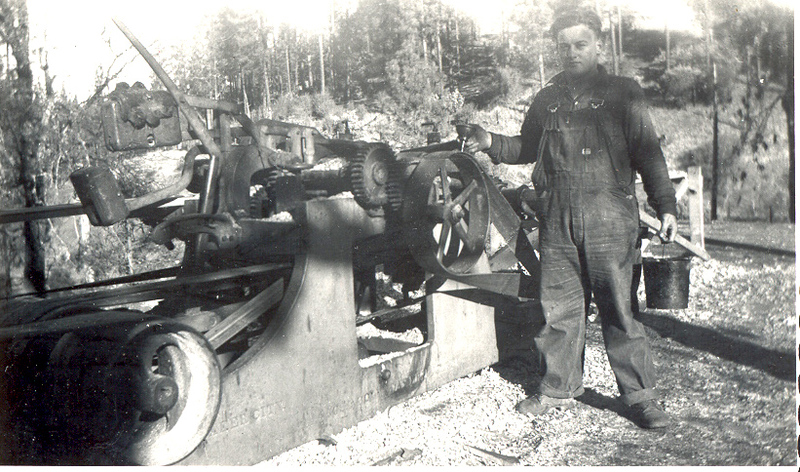 I enjoyed this article, I visited Uncle John & Aunt Martha at the sawmill as a teenager with my father, Gordon Elmore.